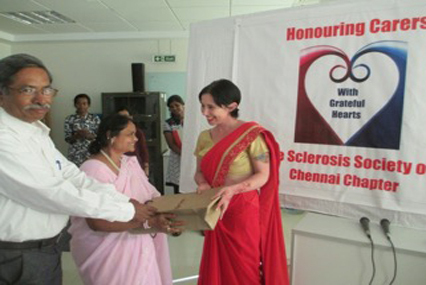 Visit of Ms. Karen Dare – MS Ambassador – Melbourne, Australia spoke to us about “Living the Challenges with MS”. She is MS person herself living with MS – a single mother of three children. She keeps herself busy as children entertainer while coping with MS and working part time at the Melbourne office. In Australia, MSP’s receive help from their government for their medications, etc. Apart from looking after her children, she also volunteered in an Orphanage in India way back in 2007. Her motivational talk kept our MS person asking her question. She patiently answered them. She was very happy to be able to interact with our MS persons. October the Month of the Carer: October for the last 19 years is dedicated to our Carers, it is their timeless effort taking care after their loved ones which the Chapter appreciated by awarding them gifts Gifts to the Carers be it parents, husband/wife, brother/sister/ daughter/son, friends were all awarded prizes. The Birthdays of the month, were celebrated with a harmonious rending of Happy Birthday and cutting of the Birthday cake followed by a sumptuous tea.